IoT in Manufacturing Market size was valued at over USD 20 billion in 2016 and will grow at more than 20% CAGR estimation from 2017 to 2024. 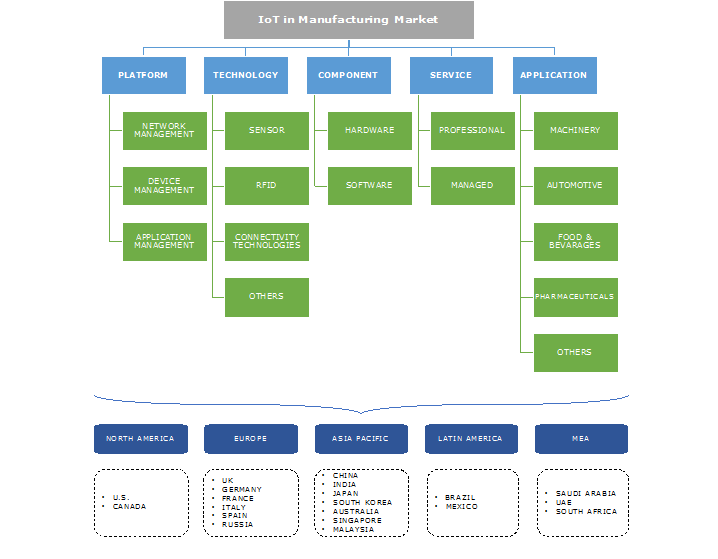 Increasing demand for enhancing the operational efficiency coupled with cost optimization is expected to drive the IoT in manufacturing market growth over the forecast timeline. Growing industrial sector in Asia Pacific provides growth impetus to the industry. It is attributed to the surge in demand from various sectors in order to gain control over the operations as well as the supply chain to result in the increased efficiency. Privacy & security concerns associated with the huge volume of data generated from a number of devices in the network might restrict the market growth over the forecast timeline. Rising incidents of cyber security breaches in various industry verticals across the globe pose challenge to the industry. Factors such as absence of standards related to interconnectivity of devices is expected to restrain the growth. Device management platforms in the market are forecast to witness growth on account of the high importance of the platform in managing several devices generating huge volume of data. In order to manage such enormous volume of data, device management platforms facilitate a smooth transition of information in the facility operations resulting in high efficiency. Application management platform segment is expected to witness substantial growth over the years due to the ease of management of different industries. Advantages of application management platforms include cost optimization & managing various software & network industries and initiate the analysis of data generated from a range of connected devices in a network. Rising adoption of technological solutions such as sensor and connectivity technology is expected to drive the market growth. Sensors are widely used technologies which measures physical variables and converts them to electrical signals. Large scale implementation of sensor technology across various industries for the purpose of generating data & monitoring facilities are expected to provide lucrative growth opportunities. Connectivity technology segment will grow owing to the rising implementation of such technologies across the manufacturing applications such as automotive and machinery. Software is predicted to witness significant growth over the future due to the increasing implementation of various software solutions such as remote management and data management. Increasing demand for remote monitoring of industries located at areas inaccessible manually is expected to boost the demand for such software solutions. In order to remain competitive in the market, various players are heavily investing on developing software solutions to the manufacturing industry. Professional services dominate the industry with a large market share. This is attributed to the rising demand for specialized technological services in the manufacturing industry. Managed services segment will grow significantly over the years owing to the emerging trend of enterprises focusing on such services. Lack of resources followed by the complexity related to the IoT network is expected to fuel the demand for managed services in the market. Predictive maintenance of the factory infrastructure coupled with the rising need of real-time visibility into data related to industrial and other processes is anticipated to drive the market growth. Automotive manufacturing will witness the significant adoption owing to the advantages of technology implementation, such as prediction and prevention of equipment failure by improvising the performance & efficiency of the assets and equipment at reduced maintenance costs. In addition, the growing trend of connected cars and autonomous vehicles will provide impetus to the market growth. With the emergence of fourth industrial revolution, Industry 4.0, the physical processes of the factories are being monitored by the cyber-physical systems to make decentralized decisions. The physical systems in the IoT network is the space where communication takes place between the machines, devices, sensors and the humans in real time resulting in more networked production. Asia Pacific is expected to grow significantly due to the high adoption across industrial hubs such as China, India and Japan. Increasing adoption of advanced technologies in manufacturing facilities will escalate the industry demand across the region. Favorable government initiatives such as Made in China and Made in India initiatives by the Chinese and Indian governments lies huge potential for the industry growth. North America is expected to witness considerable growth over the forecast timeline. This is attributed to the presence of large number of manufacturing facilities coupled with the early technology adoption in the region. 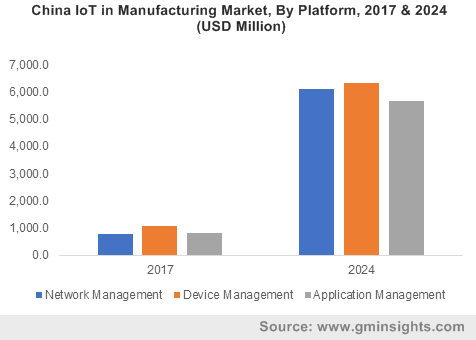 Increasing awareness of players operating in the region related to the benefits of implementing IoT in industries is expected to propel the market growth. Key players in the IoT in manufacturing industry include IBM Corporation, Intel Corporation, Microsoft Corporation, Cisco Systems, Siemens AG, Huawei Technologies and Rockwell Automation. Other prominent players in the industry include Schneider Electric, PTC Inc., Bosch and Zebra Technologies. The industry is currently witnessing entry of new players coming up with advanced and innovative products. Major players operating in the industry are heavily investing in the development as well as upgrade of technological solutions to gain eminence. The manufacturing sector dominates the IoT industry due to several use cases that allow manufacturers to improve the operational efficiency and competitive advantages across the value chain. It helps companies in terms of production asset management, safety & security, operations as well as maintenance. The industry is predicted to witness significant growth and lies opportunities for hardware component manufacturers, software service providers, network & application management providers and platform providers.